Little is known about 'Silver Charm', other than when she was born, who bred her and owned her for a time, and of her famous half siblings. But her image and the story of her family bloodlines, is in itself a window into the period she was born, as well as the state and popularity of the Chinchilla breed at that time. Significantly, she was one of the few and precious kittens out of the famous 'Dimity', a Silver female bred and owned by Miss Heather Cochran, but later the property of Lady Marcus Beresford. Her story sits centre stage, in the midst of some of the most prominent Chinchilla breeders of the period and the story behind her siblings reads like a "who's who" of the cat world. Both she and her half siblings, all came into the world during the state of flux, when the Silver Persian camp was struggling to come to terms with the proper description for the Chinchilla and its darker counterpart, the Shaded-silver. In the main, the quest for the so-called Self-Silver, became the quest for the Chinchilla. Those of a darker hue and heavier tipping, being referred to as Shaded-silvers. The problem was, that it was extremely difficult to decide in which class a particular cat belonged, as even the lightest coloured silvers were still shaded to some degree and some more-so than others. 'Silver Charm' was born on 7th May 1897, bred by Miss Heather Cochran. 'Charm's' breeder was on close terms with Mrs. Balding, the owner of 'Ch. Silver Lambkin' (known as the father of the Chinchilla breed) and Mrs. Balding's sister, Mrs. Bridgewater. Mrs. Balding and Mrs. Bridgewater were both daughters of well-known judge, Mr. Fred Gresham, and were caretakers/founders of the Silver Persian. It was to a son of 'Ch.Silver Lambkin' retained by Mrs. Bridgewater, that Miss Cochran turned to, as a potential mate for her breeding queen, namely 'Silver Owl'. Her dam was one of the most famous Chinchilla females of the era, "Dimity", the lovely daughter of 'Ch. Lord Southampton', regarded by many as the premier Chinchilla living, being as he was the line-bred grandson of 'Beauty of Bridgeyate'. Thus he was seen as the replacement for and an improvement on his illustrious sire 'Ch.Silver Lambkin', with his dam being his sire's half-sister. In essence then, 'Dimity' was bred to her sire's half-brother, doubling on her grandsire, 'Ch. Silver Lambkin'. So from this quotation, 'Dimity' is clearly referred to as a Chinchilla, whereas her registration was simply as a Silver and therefore open to interpretation! In the National Cat Club register, 'Silver Charm' is registered as a Chinchilla, under the number 3096, with no date of birth, with Miss Cochran as her breeder and her owner listed as Miss R.A.Packham, another major breeder of Chinchilla's, including those bred by Mrs. Wellbye, such as 'Silver Jessamine'. 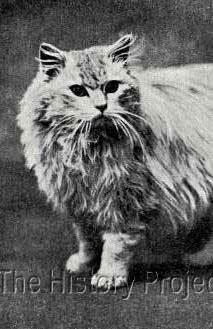 In the register of The Cat Club, she is similarly listed, without a registration number, but described as a Self-Silver, with the birth date of 7th March 1897. In this record Miss Cochran is listed as breeder and owner. 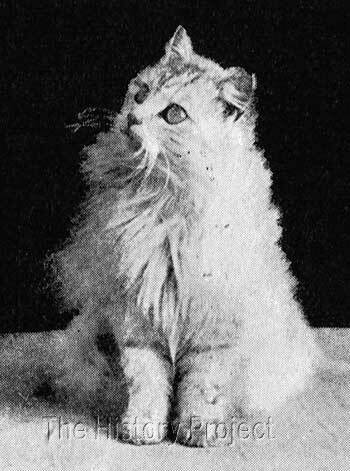 We have no record of when she was transferred from the ownership of Miss Packham to Miss Gertrude Willoughby (later Lady Decies), but in 'The Cat Manual' published in 1902, her photo is clearly captioned as "Silver Charm, Chinchilla, the property of Lady Decies." Such a transfer of ownership would make a lot of common sense, as Lady Decies by this time was also the owner of 'Ch. Lord Southampton', having purchased him for the largest sum of money paid out for any stud cat living at the time. As his granddaughter, and the one of the very few daughters of 'Dimity', this would have made 'Silver Charm' a valuable acquisition. This also explains why in some databases, she is also listed as 'Fulmer Charm'. The value placed on 'Silver Charm' can only be surmised at best, but it would be a fairly safe presumption on our part to say she was highly prized. Through her dam 'Dimity' she was an older half-sibling to both, 'The Absent-Minded Beggar' and 'Puck III'. The 'Absent-Minded Beggar', (born 27th April 1899) was produced by mating Dimity to her sire, 'Ch. Lord Southampton'. 'Beggar', when owned by Mrs. Clark of Ashbrittle, was subsequently described in advertising as "an exceptionally pale unmarked Chinchilla, cobby, low on legs, magnificent quality coat, lovely broad head, sweet expression, and greenest of eyes." An older full sister to 'The Absent-Minded Beggar and therefore also a half-sibling to 'Silver Charm' was 'Windsor Daisy' (born 1898), bred by Miss Cochran and owned by Lady Marcus Beresford. Earlier in 1898, Miss Cochran had bred 'Dimity' to her 'Sweetboy' and the resulting silver female 'Chiffon' (born 30th April, 1989), had been retained for breeding. Dam siblings bred from 'Dimity' while under the stewardship of Lady Marcus Beresford include, 'Windsor Chintz', (born 28th March, 1900), a Shaded-silver female by 'Windsor Beetle' a son of 'Lord Southampton'. In a repeat of this breeding, born 24th July, 1900, came two more Shaded-silvers, a male 'Windsor Stagbeetle' and a female 'Windsor Cretonne'. All were retained by Lady Beresford. 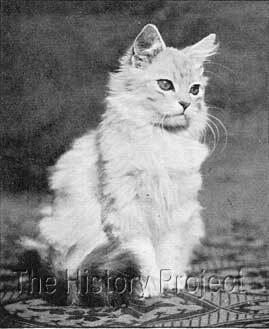 From a 'Dimity' litter born 18th April 1901, sired by 'Silver Starlight' (1898) a male owned by Mr.s Balding, came three more significant kittens. Two were the Silver females 'Windsor Silver Bubbles' and 'Windsor Silver Shell', which were both retained by Lady Beresford, and the third was 'Puck III' a Silver male, which was subsequently sold as a future stud to HRH Princess Victoria of Schleswig-Holstein. No information on progeny is recorded or available at this time. Although none are available at the time of writing for 'Silver Charm', the following are stud advertisements for her two dam-siblings, 'The Absent-Minded Beggar' and 'Puck III'.